The Asbury Park Music and Film Festival will host the premiere screening of “Between Me and Mind,” the feature documentary looking into the creative process of founding Phish guitarist and vocalist Trey Anastasio, Sun., April 28 at 7 p.m. at the Paramount Theatre in Asbury Park. Following the screening, the film’s producer, Jamie Schutz, will sit down for a Q&A session with Editor-In-Chief of Relix Magazine, Mike Greenhaus. 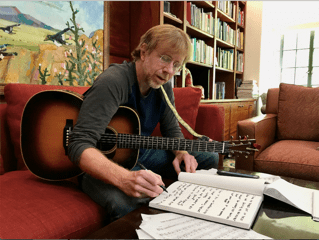 Shortly through this look into the creative process of founding Phish guitarist and vocalist Trey Anastasio, it becomes clear that he is simply exploding with creativity and joy like few others. As the frontman of one of America’s longest lasting and most successful touring bands and a solo musician as well, Anastasio’s virtuosic musicianship has made him an icon, beloved by his die-hard fanbase for the depth of his artistic output and the boundless enthusiasm that he exudes on stage and off. The film captures Trey as he works through some of his most personal song ideas to date, placing his relationships with friends and family at its core. At the same time, he prepares for one of Phish’s legendary New Years Eve shows at Madison Square Garden, culminating with the exhilarating, elaborately produced moment when the clock strikes midnight on-stage. The festival will be held from April 25 to 28 in Asbury Park. It kicks off April 25 at the Paramount Theatre when recording artists Jakob Dylan, Cat Power, Jade (Edward Sharpe and the Magnetic Zeros) and special guests will perform songs by The Byrds, The Beach Boys, and The Mamas and Papas following the New Jersey premiere of Echo In The Canyon. The Bruce Springsteen Archives is taking place at the Paramount Theatre on Sat., April 27 at 4 p.m.
Thom Zimny, long time film director and archivist for Bruce Springsteen, will present an exclusive screening of rare and never before seen footage. Following the screening, a panel discussion and Q&A will take place moderated by Backstreets editor, Chris Phillips. Two-time Rock and Roll Hall of Fame inductee, David Crosby, and film director Cameron Crowe, will take part in a Q&A discussion following the New Jersey premiere of “David Crosby: Remember My Name” (Sony Pictures Classics), a documentary about the legendary musician, at The Paramount Theatre on Sat., April 27 at 7 pm. Oscar winner Peter Farrelly, and brother Bobby, will appear at The Paramount Theatre on Sun., April 28 for a career retrospective, highlighting their mutual impact on the film industry. The evening will include an in-depth discussion moderated by Deadline Hollywood’s Mike Fleming, audience Q&A and very special guests. Asbury Park: Riot, Redemption, Rock ‘N Roll, the story of the long troubled town of Asbury Park and how the power of music can unite a people divided, will screen on Sun., April 28. An early cut of this film played to a sold-out Paramount Theatre at the 3rd Annual APMFF on a now legendary night which featured surprise appearances from Little Steven and the Disciples of Soul, Southside Johnny, Bruce Springsteen and a cast of all-stars from the legendary Upstage Club in Asbury Park. Clarence Clemons: Who Do I Think I Am? will screen on Saturday, April 27. Dylan Archives IV presented by the Bob Dylan Center will take place on Sunday, April 28 at The House of Independents. The Paramount Theatre will host “The Gary US Bonds Unusually Big Birthday Bash” with special guests Joe Grushecky and The Houserockers on Fri., April 26. Hot Water Music will celebrate their 25th anniversary at the House of Independents and will mark the occasion by playing albums No Division and Caution in their entirety, respectively on Saturday, April 27 and Sun., April 28. Jake Miller will also play the House of Independents stage on Fri., April 26. In addition, on Sunday April 28, Rock and Roll Playhouse Presents The Music of Bruce Springsteen For Kids will be at The Stone Pony and Jazz Is Phsh at The Wonder Bar.